The University of Dubuque men’s lacrosse team is a new program recently launched as a varsity sport, and began intercollegiate competition in the spring of 2014. Lacrosse is a relatively new sport in the Midwest, we encourage you to join and help establish the Spartans as a winning lacrosse team. Expand your experiences and come see lacrosse, which combines the discipline of many sports into this rigorous, challenging sport of Native American origin. The Spartans joined the CCIW for men's lacrosse in 2015. Rain or shine, take advantage of the state-of-the-art, indoor Veterans Memorial Training Center, all year-round in a multi-purpose facility that features nearly 40,000 square feet of Mondo synthetic turf that simulates the feel and play of real grass. Veterans Memorial is located right next to Oyen Lacrosse/Soccer Field and hosts in-season and off-season workouts. Both facilities are apart of the Chlapaty Sports Complex. Take a tour of the University of Dubuque Athletic facilities with senior captain Tyson Svoboda. The University of Dubuque men's lacrosse team (5-9 overall, 1-3 in CCIW) played the conference best team on Wednesday and lost 9-30 to Illinois Wesleyan University (12-1 overall and 4-0 in CCIW). The University of Dubuque men’s lacrosse team snapped a losing skid with a dominating, 18-8 win over conference foe, Carroll. If you're interested in playing men's lacrosse at the University of Dubuque, complete the prospect form, and a coach will be in touch. 0 Michael Jango Attack 5-9 160 Junior Upton, Mass. 4 Davis Behrns Attack 6-1 180 Sophomore Whitefish Bay, Wis.
5 Garrett Smith Defense 6-3 190 Sophomore Algonquin, Ill.
7 Tanner Weis Attack 5-7 140 Sophomore Windsor, Colo.
12 Noah Perry Attack 6-5 230 Freshman Tinley Park, Ill.
14 Zach Krukovsky Defense 6-3 225 Freshman Phoenix, Ariz.
15 Ethan Senesac Attack 5-8 180 Junior Homewood, Ill.
16 Jake Herman Attack 5-6 180 Freshman Lockport, Ill.
17 Gavin Hughes Attack 5-10 145 Freshman Cary, Ill.
20 RayAndrae Dunn Defense 6-1 230 Sophomore Elmont, NY. 21 Joey Maniaci Attack 5-7 150 Freshman Pewaukee, Wis.
25 Nick Wallace Defense 6-0 210 Sophomore Bloomington, Minn.
28 Dominic Mulcahy Midfield 5-8 160 Freshman Shakopee, Minn.
29 Ryan Nemeth Goalie 5-10 150 Freshman Waukesha, Wis.
31 Ethan Maurisak Goalie 6-0 170 Freshman Verona, Wis.
32 Dante Robinson Defense 6-4 175 Freshman Glenwood, Ill.
34 Mark Heitkotter Midfield 5-11 160 Freshman Hanover Park, Ill.
36 Thomas Martin Defense 5-4 185 Freshman Sault Ste Marie, Mich.
39 Jacob Cobb Defense 6-0 185 Freshman Homewood, Ill.
44 Ryan Gartner Goalie 6-2 190 Freshman Elgin, Ill.
47 Samuel Kopecky Goalie 5-10 325 Senior Sussex, Wis.
64 Logan Farley Defense 6-2 175 Freshman Westminster, Colo.
Kasey Burst enters his fourth year as the Spartans Head Men's Lacrosse Coach. A native of Syracuse, N.Y., Burst joined the Spartans in 2016. He is the third coach in program history. In his second season, Burst led the Spartans to a 10-7 overall record in 2017, to complete the first winning season in program history. Burst came to UD from Clarke University. 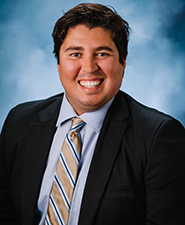 He spent the 2014/2015 academic year building Clarke’s men’s and women’s inaugural lacrosse programs. Prior to Clarke, Burst spent three years as first assistant coach for Division III Clarkson University in Potsdam, N.Y., where the Golden Knights' compiled a 26-19 overall record from 2012-2014. He helped lead Clarkson to back to back Liberty League Tournament appearances in 2012 and 2013. In 2013, Clarkson advanced to the Liberty League championship game before falling to eventual national runner-up, Rochester Institute of Technology. Burst is a 2010 graduate of NCAA Division I Mount St. Mary's University (MD), where he earned two Bachelor of Arts Degrees in International Studies and Spanish, as well as a Masters Degree in Business Administration. During his time as a defenseman at the Mount, he appeared in 37 career games, and was named to the conference’s All-Academic team three times. Burst is a member of two conference championship teams in 2010 (Metro Atlantic Athletic Conference) and 2011 (Northeast Conference). He competed in the 2010 NCAA National Tournament, in a first round game vs. Virginia. After their first winning season in program history in 2017, the UD men's lacrosse team finished just one game below .500 in 2018 with a 8-9 record. Five different Spartans totaled 10 goals or more in 2018, led by Michael Jango who had 34. Jango also added 12 assists to lead UD with 46 total points. Michael Julius was not far behind Jango, as he put up 29 goals and 11 assists for 40 points. In his freshman campaign, Tanner Weis had 31 points for the Spartans with 16 goals and 15 assists. His 15 assists were the most by any Spartan. Kyle Mullins started all 17 games in 2018 to wrap up his illustrious UD career. Mullins came up with 186 saves for a save percantage of .550 during the 579 shots he faced during his senior season. Mullins never missed a game during his four year career, starting all of them in the net and holds the school-record in every statistical category for the goalie position. As a midfielder, Michael Julius wrapped up his career as one of the most productive players in UD’s history. In his time at UD Michael has scored 62 goals, recorded 57 assists, gathered 64 ground balls, and has caused 20 turnovers. He started in all 49 appearances His 119 career points makes him UD’s all-time leader in career points, in only 3 years. Michael also holds the all-time assists record with 57. His 28 assists in 2017 is a single season record for the Spartans. His 62 goals put him 2nd all-time in goals scored in a career. As the all-time point’s leader for UD, Michael surpassed Tyson Svoboda back on March 14th of this year against University of Northwestern. He is only the second player in UD history to surpass the 100 point mark. DUBUQUE, Iowa - The University of Dubuque men’s lacrosse team completed the 2017 campaign with a 10-7 overall record to complete the first winning season in the program’s four years. Four of the seniors, Tyson Svoboda, Javez Vargas, Josh Berry-Wingate and Jonas Steinborn, were the first student-athletes to play four seasons as a part of the University of Dubuque men’s lacrosse program. The senior class will be a tough one to replace as they leave with 69 games played,48 starts, 68 goals (34.5%) and 30 assists (26%) in the 2017 season. Tyson Svoboda left UD as the all-time leading point scorer with 101, the first person in school history with 100 points. Svoboda is also the leader in all time games played and games started with 54. In his final season, Svoboda was fourth on the team with 31 goals, while also dishing out 12 assists. Josh Berry-Wingate, a senior from Homewood, Ill. Berry-Wingate had 35 goals this season, good enough for third on the team and added 18 assists for 53 points to finish with 89 points in his career, second all-time. Jonas Steinborn from Madison, Wisconsin and Javez Vargas from Homewood, Illinois, were mainstays on the Spartans defense over the last four years and helped the defense improve each year. Billy Ertl (Danville, Ill) joined the lacrosse program his sophomore year, playing in a career high eight games this season. Matt Penalvert led the Spartans offensive attack this season, posting 41 goals and 60 total points. The 41 goals was a school record for a single season, besting the previous mark by 21 goals. His 60 points is also a single season record. Michael Julius handed out 28 assists, breaking his own school record of assists in a season which was previously 19. UD went on their longest winning streak of the year from March 25th to April 28th, winning four games in a row and outscored their opponents 56-17 during that stretch. UD protected the home turf, going 6-2 at Oyen Field. The Spartans saved their best game for last, beating Clarke University, 28-1 in the season finale, which was the largest win in program history and the most goals scored in a single game. Under first-year head coach, Kasey Burst, the Spartans finished fifth-place in the CCIW conference with a 2-11 overall, 1-4 record in the CCIW conference. The Spartans just missed out on the final spot in the four-team CCIW tournament after falling to Elmhurst College, 12-6, in the season finale. With a win, the Spartans would have qualified and left Elmhurst out. Three Spartans were among the statistical leaders during league play with freshman midfielder Michael Julius finishing second in assists per game (2.40) and points per game (4.20), midfielder Joshua Berey-Wingate pacing the CCIW in ground balls per game (11.20) by a wide margin, and 2015 All-CCIW goalkeeper Kyle Mullins leading in total saves (59). UD played arguably their best two games to conclude the season with their largest win in school history on Senior Day against Carroll, 17-1, in the penultimate game, followed by a close defeat to Elmhurst. The Spartans hung tough against a Bluejay squad that had lost to the trio of CCIW frontrunners by eight goals combined. Burst, who started both men’s and women’s lacrosse programs at Clarke University, faced his former team in their first-ever collegiate game in a 9-8 season-opening defeat at UD. Freshman midfielder Michael Julius paced the team with 36 points, including 17 goals and 19 assists. The Aurora, Ill. native scored three goals with a school record 10 assists in win over Carroll. Front Row: Britton Harris, Tyson Svoboda, Colin Grever, Josh Berry-Wingate, Dante Victum, Joshua Cramer, Brandon Jagitsch, Icle Freeland, and Alex Jameison. Back Row: Head Coach Tyler Simmons, Kyle Mullins, Connor Kern, Andrew Poncer, Andrew Mayfield, Efrain Rodriguez, Collin Perry, Mike Utley, and Asst. Coach ?. DUBUQUE, Iowa – Freshman goalkeeper Kyle Mullins anchored the Spartan defense and captured All-CCIW (College Conference of Illinois and Wisconsin) honors in leading the University of Dubuque men’s lacrosse team to their first win in program history, a 2-10, 1-4 CCIW record good for fifth-place in the conference. With only two seniors, Mullins led a youth movement for the Spartans in their first year of conference affiliation. Tyson Svoboda paced the team with 15 goals while Britton Harris added 10 goals. Josh Berey-Wingate, the faceoff specialist, dished out a team-high seven assists and won a team-best 78 of 185 faceoffs to go with 53 ground balls. Mullins garnered second team All-CCIW (College Conference of Illinois and Wisconsin) honors after leading the conference and the University of Dubuque men's lacrosse team with 85 total saves in five CCIW games. The freshman stopped 182 shots over the course of the entire season and his second-team nod was the first-ever conference honor for the Spartans. The Lakewood, Colo. native started 11 of 12 games and finished with a 15.86 goals against average. He totaled 10 or more saves in 10 of 12 games while facing 607 shots and concluding 2015 with a 2-9 record. Mullins' 85 saves in league play was more than double the next highest total (34) and one less than the next three goalkeepers combined. Mullins collected seven saves and Icle Freeland, Tyson Svoboda, and Colin Grever each scored twice as the Spartans defeated Defiance (Ohio) on March 21, 8-4, for their first-win in school history. It was a team effort after UD faced a 4-0 deficit early in the game. Two games later, UD won its first CCIW game after extending a 4-0 lead into a 12-4 triumph on March 28 over Carroll University (Wis.) in their first conference road game. Freeland, Svoboda, Britton Harris, and Josh Berey-Wingate represented the scoring with three goals each. Freeland and Berey-Wingate added two assists as well. Mullins finished with 13 saves. #2-Alex Jameison, #4-Tyson Svoboda, #6-Colin Grever, #10-Joaquin Cruz, #11-Connor Kern, #12-Deroulo Cadet, #13-Jonas Steinborn, #15-Isaac Hernandez, #17-Andrew Poncer, #18-Javez Vargas, #19-Eric Frank, #21-Nathan Pomorin, #23-Josh Berry-Wingate, #24-Louis Levine, #25-Chad Whitford, #26-Brandon Smoot, #29-Efrain Rodriguez. The Spartans faced a learning curve after going winless (0-12) as an independent team in their inaugural season. Coach Tyler Simmons’ squad gained valuable experience and were led by sophomore Brandon Smoot who scored a team-high seven goals and three assists. Twenty-eight of his 59 shots were on goal as he started nine of 12 games. Defensively, freshman goalkeeper Deroulo Cadet was a staple between the posts after starting 11 of 12 games. Cadet faced 626 shots and recorded a save percentage of .413. Expect those numbers to fall behind a more experienced defense and seasoned frontline. On the backline, junior Jonas Steinborn led the charge after causing a team-high 26 turnovers and scooping up 29 ground balls. Faceoff specialist, freshman Josh Berey-Wingate, won in the trenches with 83 faceoff victories. Smoot also had 57 ground balls as both statistics led the team. The Spartans will compete in the College Conference of Illinois and Wisconsin (CCIW) starting in 2015. 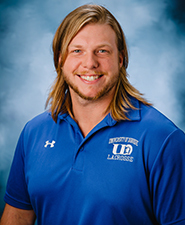 The University of Dubuque announced the appointment of Jake Olsen as head men's lacrosse coach for the Spartans on December 23, 2011. The Spartans will competed in their inaugural season of Lacrosse in 2013 as a club team before joining the NCAA in 2014. There are currently 189 Division III Men's Lacrosse teams and 201 Division III Women's Lacrosse teams competing in the NCAA. UD will compete in 2014 as an independent.